Some of the recent economic data and graphs from the St. Louis Federal Reserve look more like a ski slope or snow boarding run at the X-Games. In some instances the charts look truly scary, or encouraging, depending on the trend and your perspective. 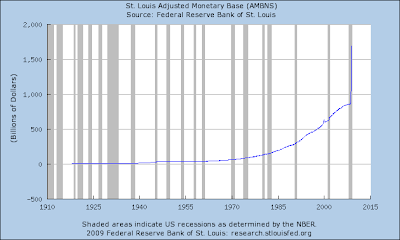 For instance, if you were worrying that the Fed was not doing enough to flood the system with liquidity (or worrying that it was doing too much), check out the recent Adjusted Monetary Base chart. Are you thinking about re-financing, but not sure if rates are attractive? 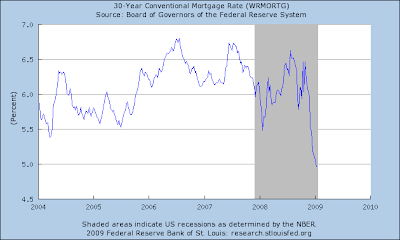 Check out the chart of conventional 30-year fixed mortgage rates. Have you noticed that it does not cost quite as much to fill-up your car as it did just a few months ago? 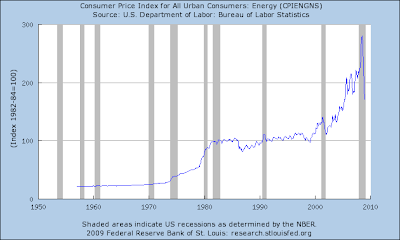 Check out the move in the energy component of the consumer price index. 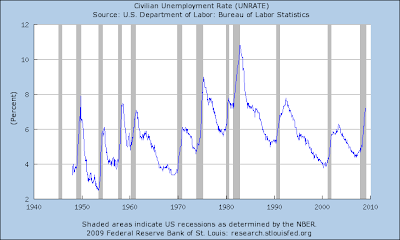 Are you wondering whether the unemployment rate is really spiking, and how it compares to other recessions? 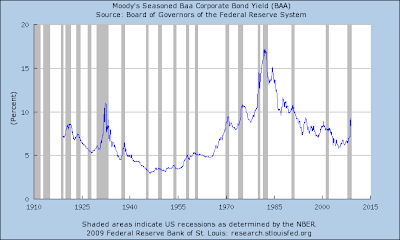 Check out the following chart (the current loses are large, but not at historical extremes - meaning there is good and bad news - it is not as bad as it as been, but worse rates are not unprecedented). Have you heard that we are moving from manufacturing to a service-based economy, but have been wondering just how long this has been occurring? 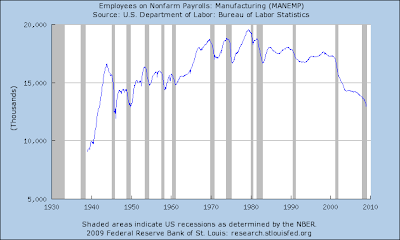 Check out the number of manufacturing employees over the last three decades, and the last year. Given the recent employment numbers in manufacturing and the general economy over the last year, it is not surprising that capacity utilization is falling off a cliff. 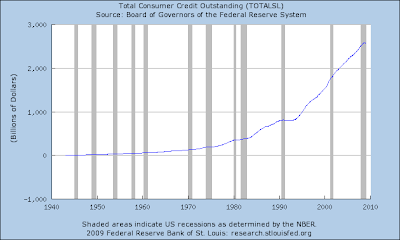 Wondering if other consumers have also been taking on extra credit over the last 20 years? Don't fear, you are not alone (well, maybe you should be fearful). 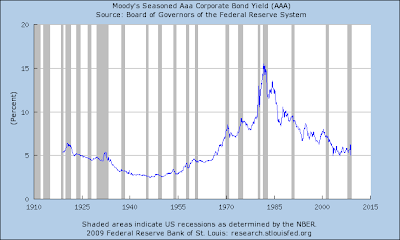 How have Aaa and Baa Corporate Bond Yields compared? The charts certainly seem to be reflecting some risk in the market (compare the two over the last year). 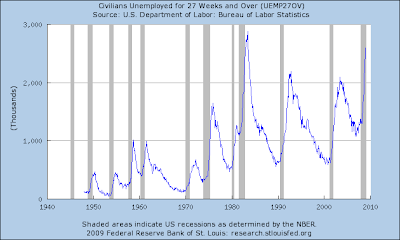 Finally, and even more disturbing, are the number of people that have been unemployed for 27 weeks or more. Given the spike up in extended unemployment, it is not surprising that home foreclosures are also increasing at a rapid rate. 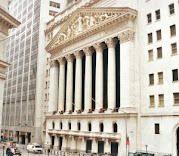 Of course, I have focused on some of the more extreme charts, and even those pictures that truly are "worth a 1000 words" or more don't tell the entire story. Nonetheless, the last year has been interesting, even though some of trends have been in place for a while. While we marvel at the moves, it is also worth remembering that charts and series with such violent spikes or declines are often followed by similar extreme and violent reversals - although for some moves, such as in energy prices, you could argue that this is what we are currently seeing. Finally, I suspect that the picture being painted in each of these charts is far from compete in most instances. Whether we like it or not, the unintended consequences and fall-out from turning-on and then turning-off the liquidity faucet should provide additional topics for discussion months and years to come. Such moves will no doubt also create new challenges and opportunities.